Let’s start with the good first. 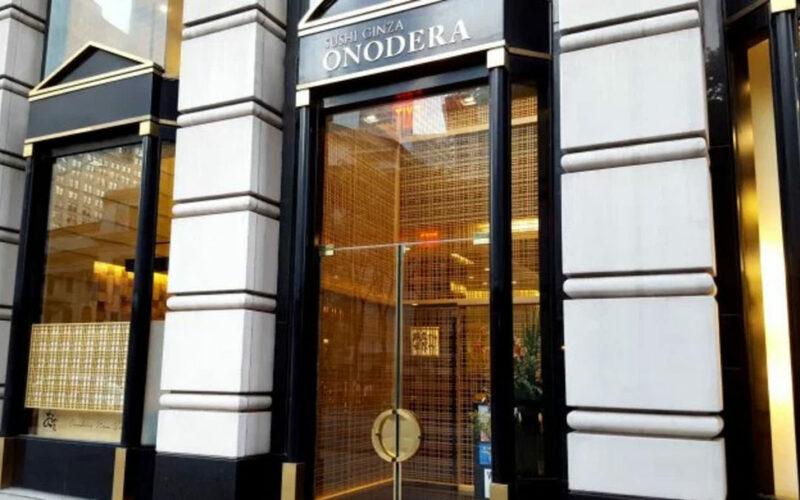 Onodera is truly a lovely experience. We go so rarely, yet they remember us. Down to our likes and dislikes. How is that possible? Did they take notes after? Or do we stand out that much? Truly, I remember everything about my meals. Boyfriend will ask me, where did we have that… or who served that fish in that specific way… or where did we hear that story about… And I remember it all. It could be a month ago, a year ago, two years ago, three… I remember it all. But I am one person, sushi-ing three times a week. I am not an institution with five seatings a day, multiple patrons per seating. How do they do it? Incredible. Today, Saito-san was as lovely as ever, humorous, witty, chatty, sharing all his sushi-wisdom, discussing whatever you want, allowing you to lead the conversation and questions. From an atmosphere/experience perspective, impeccable, immaculate! Here’s the bad. I’ve been seeing a trend lately, where our sushi-yas are stocking less and less variety. In the past, they’ll stock a few cuts of one/two shell clams, a few types of shrimps, octopi, and squids. Now, it’s just a bunch of whites, reds, oranges, one or two silvers, AN UNI and A ROE, and that’s it. I figured Onodera, being the premium sushi-ya that they are, would be exempt from this wretched trend. But nope, they fall victim just like the rest. It’s sad. Today, our 15 piece lunch omakase consisted of 1 CHAWAN MUSHI, 2 whites, 5 tunas, 2 silvers, 1 squid, 1scallop, 1shrimp, 1 UNI, and 1 ROE. This is all fine for the 15 serving omakase. 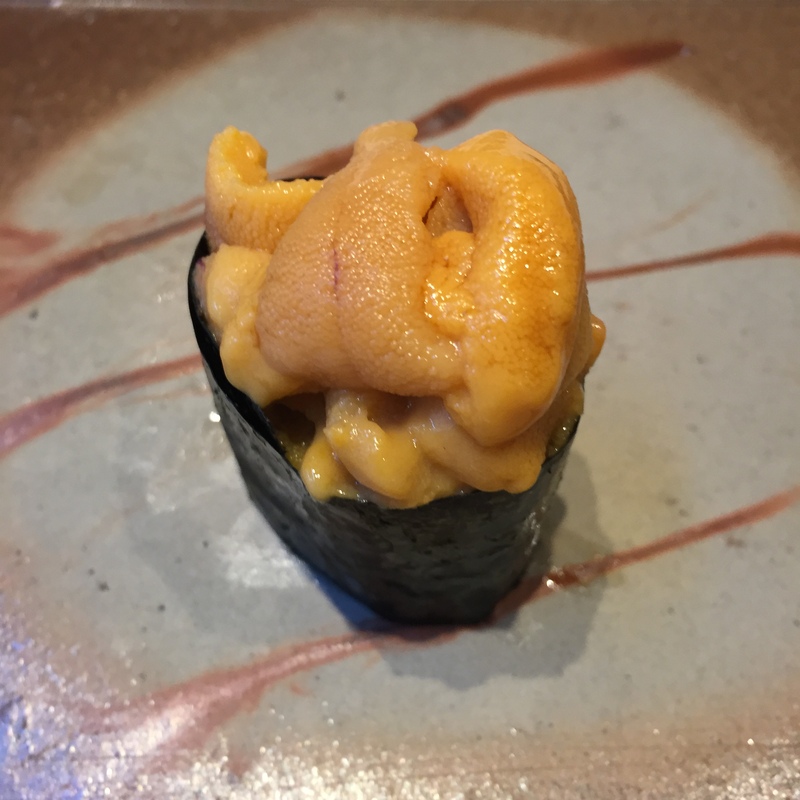 But after our omakase, when we tried to order additions, tried to order more exotic fishes, other one/two shell clams, shrimps, octopi, or UNI. Saito-san had tons of the other run-of-the mill stuff, but nothing exotic. This was very disappointing. 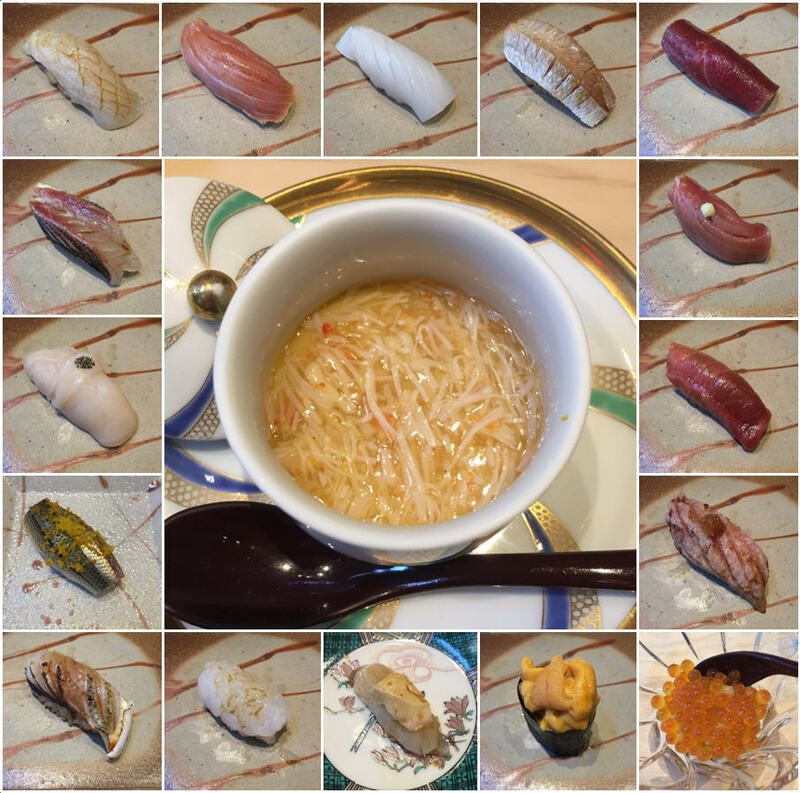 That said, the omakase offering was still a very solid omakase. 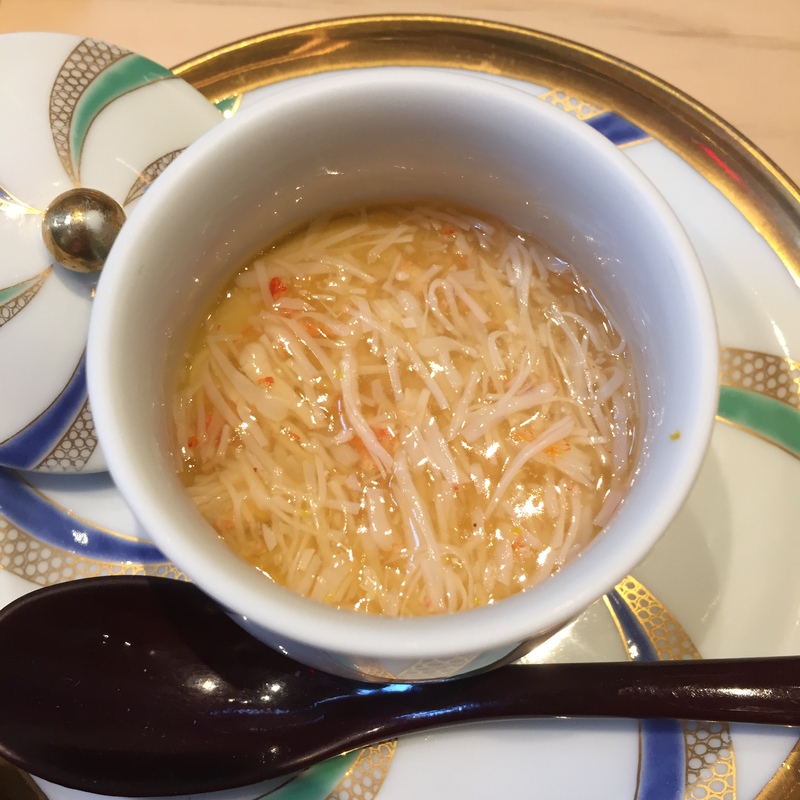 CHAWAN MUSHI with UNI and KEGANI (hairy crab) – I know this photo doesn’t show the UNI so well, but it’s there, I promise. This was amazingly decadent. 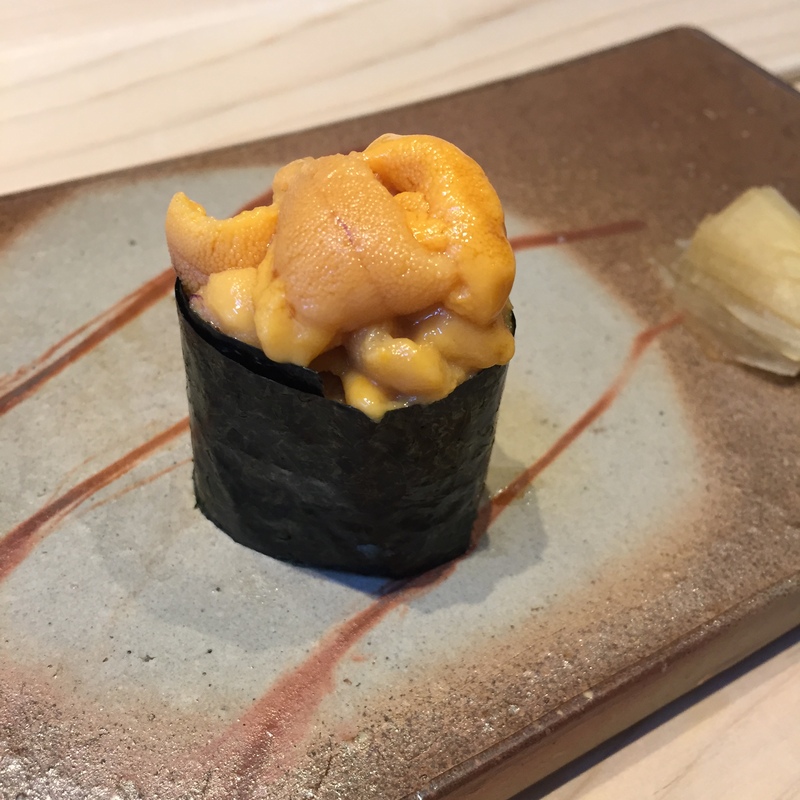 The CHAWAN MUSHI itself was super silky and creamy, and topped with the layer of perfectly seasoned UNI/KEGANI, this had just the right flavors. Delish! 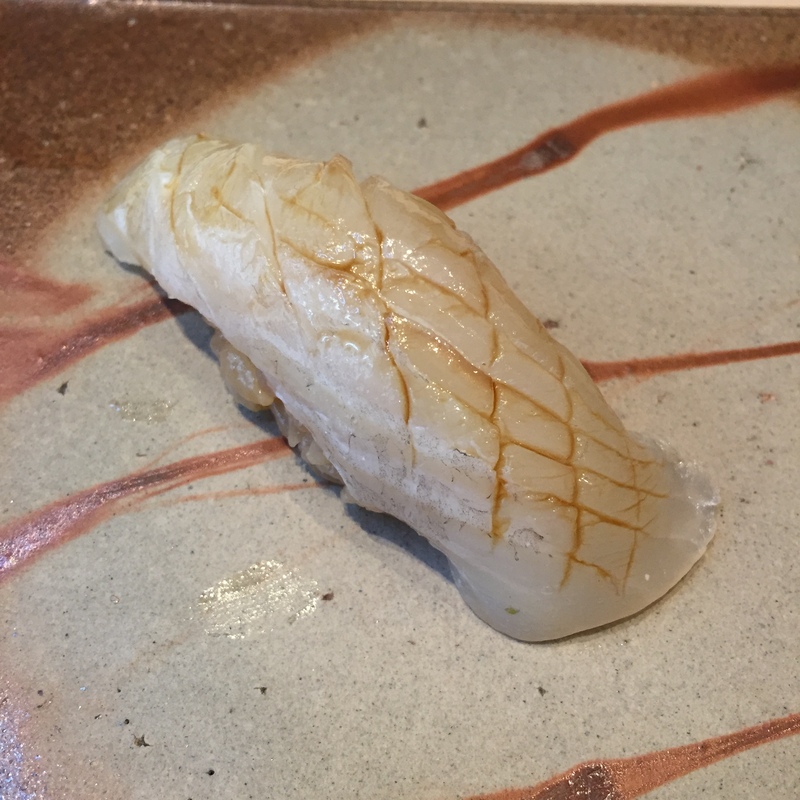 HIRAME (flounder) KOBUJIMI (marinated in the Japanese kelp KOMBU) – Marinating in KOMBU is the only way to make such a plain and unexciting fish shine. Very good. 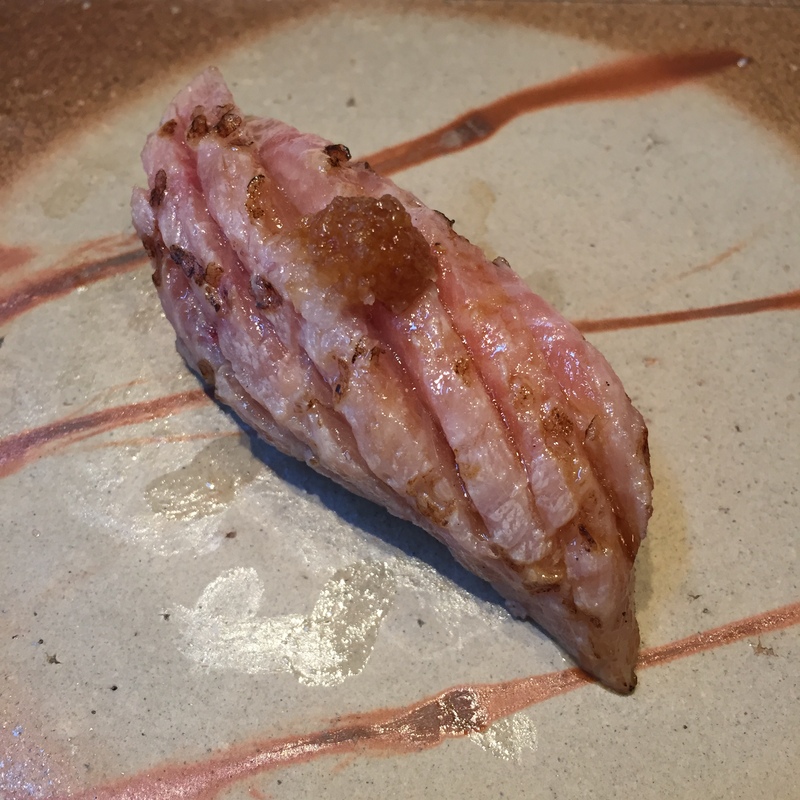 BURI ZUKE (An adult yellowtail marinated in soy) – Usually not a huge fan of BURIs, but I do like this one. 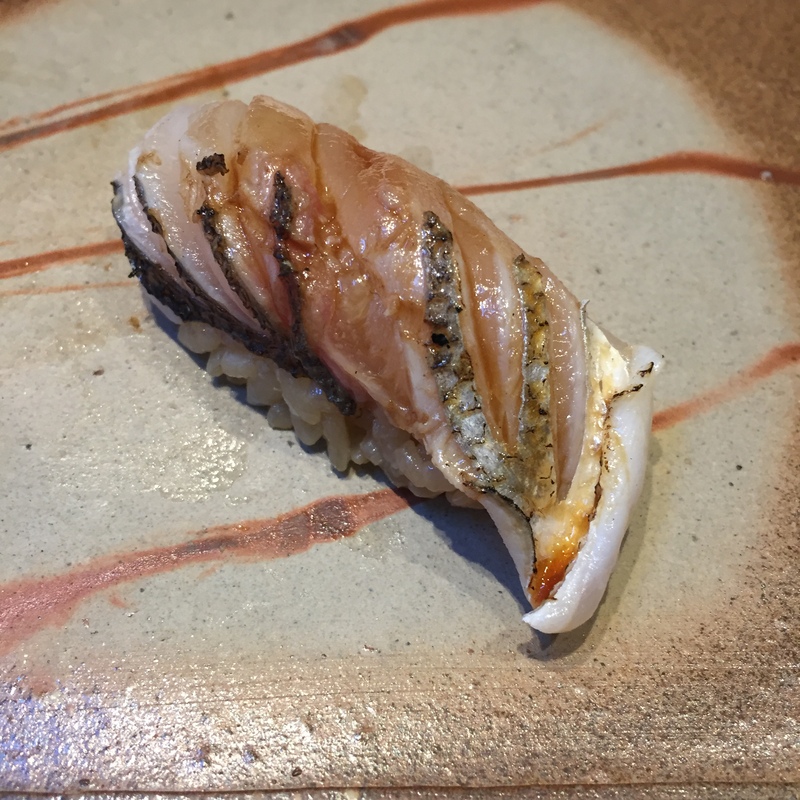 SURUME IKA (Pacific squid from Tokyo Bay) – This was fine, but really, nothing special. 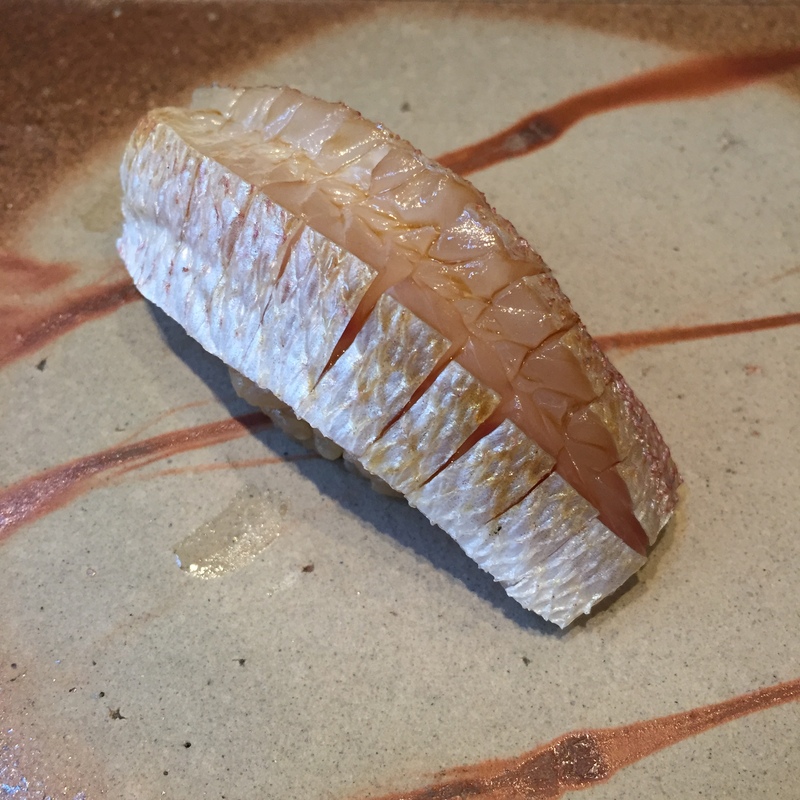 KASUGODAI (Baby red snapper) – Saito-san has one of the tastiest SHARIs (sushi rice) in town. Truly flavorful. When you have an incredibly mild fish, and you don’t do anything to really make that mild fish shine, your incredibly flavorful rice will steal the show… Pity, I usually love KASUGODAIs, today’s serving didn’t do this fish justice. 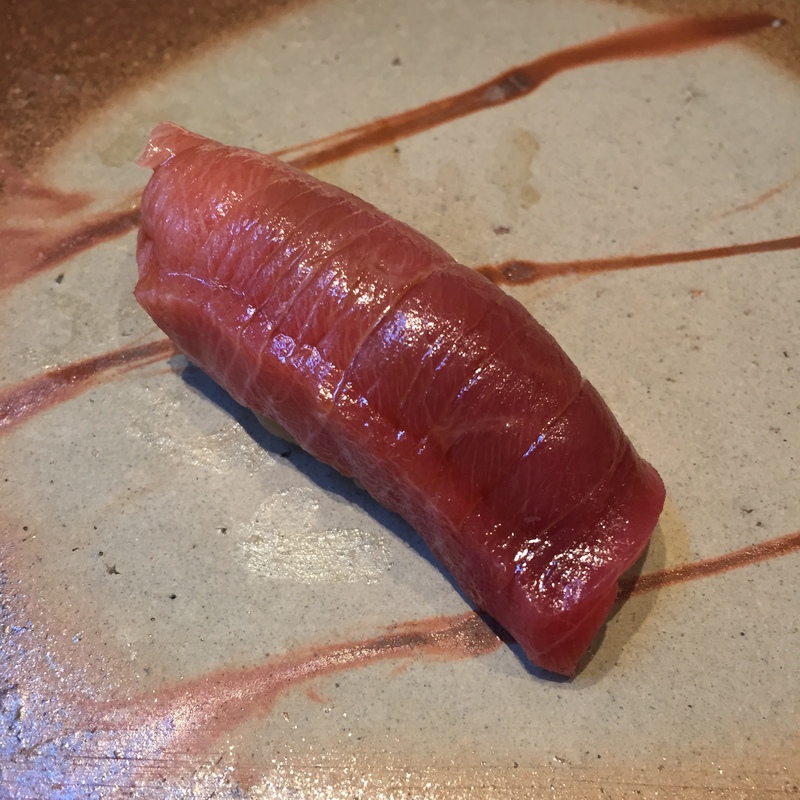 AKAMI ZUKE (Lean Bluefin tuna marinated) – Odd that we get two zukes in one meal, but I LOVE me some AKAMI ZUKE! 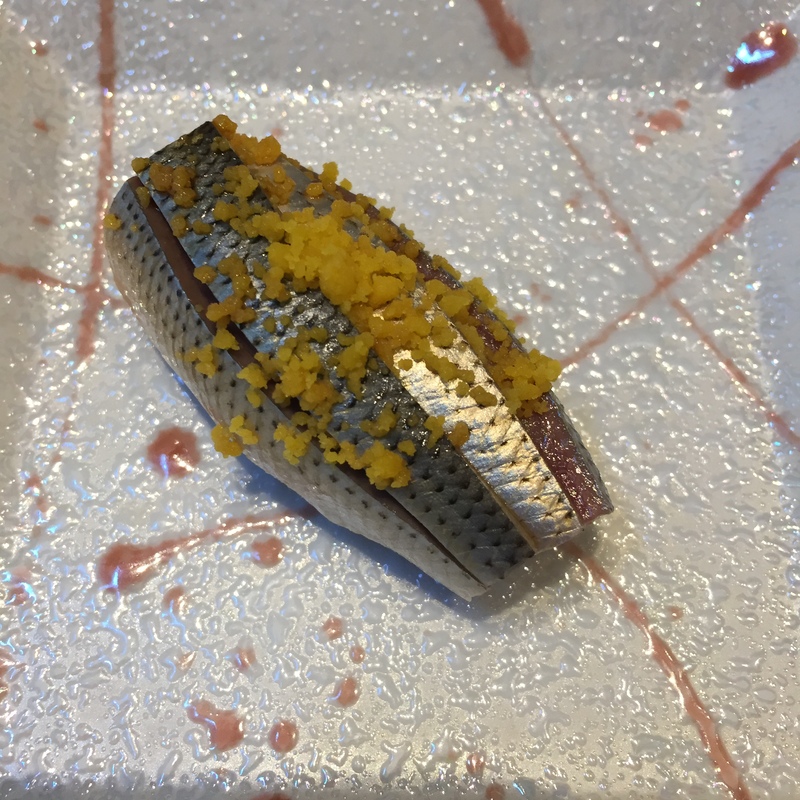 KAMASU (Barracuda) – My favorite piece yet! The torching left this fish so nice and smoky. Unlike the KASUGODAI, this pairing was just perfect! 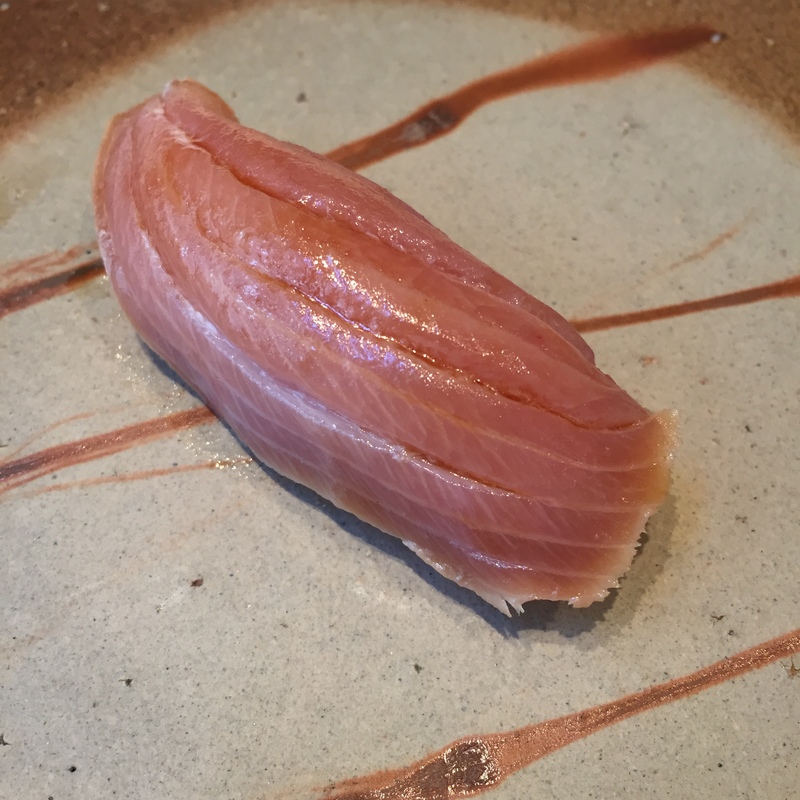 MEIJI MAGURO (Baby Bluefin tuna) – I thought it was too early to fish for MEIJI MAGURO? I thought the Tuna gods said no fishing till April? 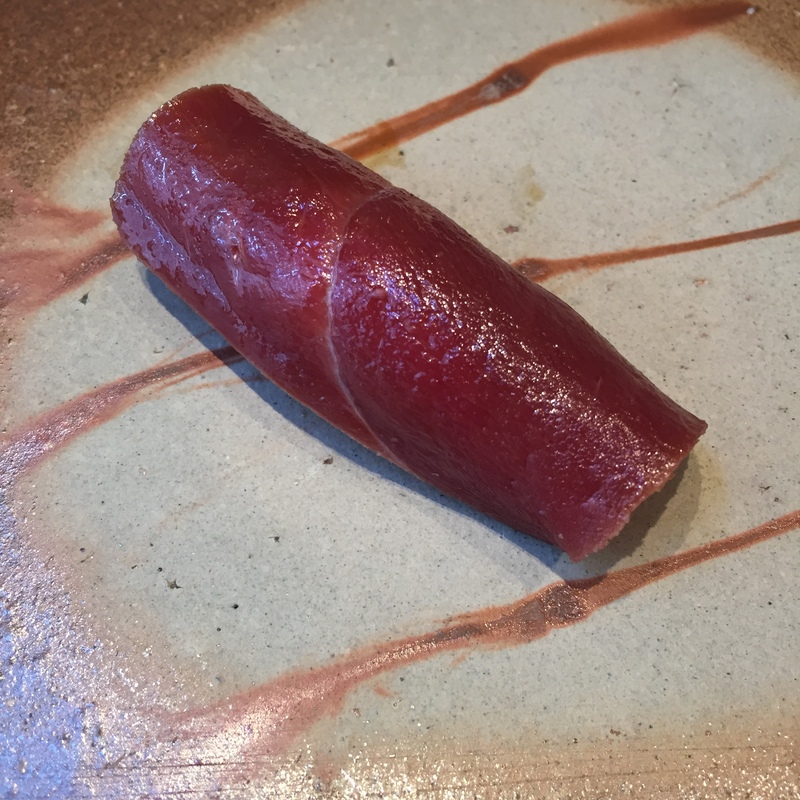 Who knows… Like all baby anythings, the MEIJI MAGURO is more tender, and more mild in taste. Saito-san layered in some chives between the MAGURO and the rice. THIS IS WHERE BAE (Oona Tempest) picked up, what I call her SHIMA-AJI-wonder technique! Thoroughly enjoyable! 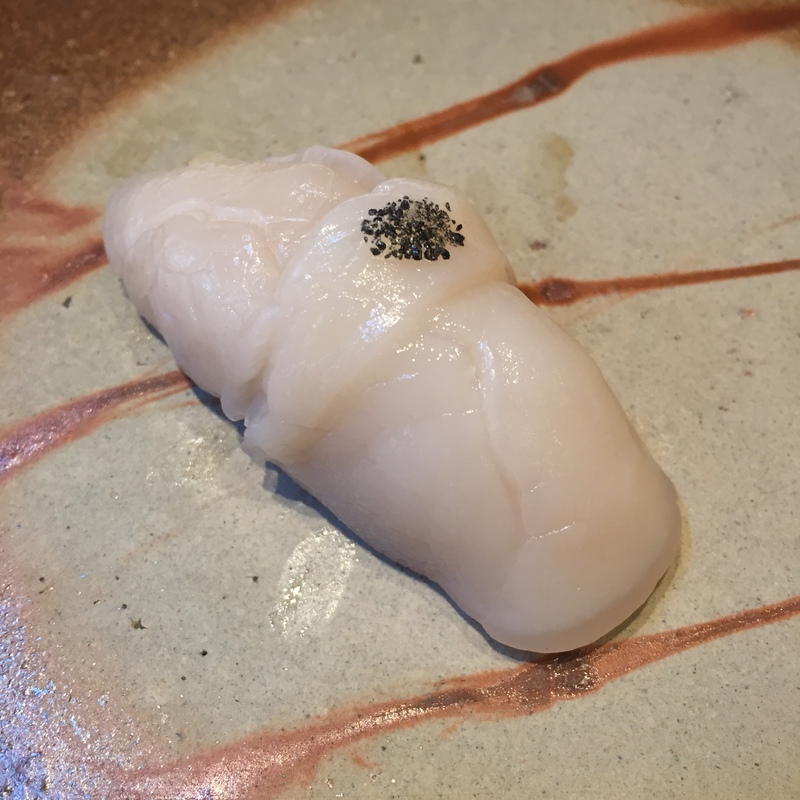 HOTATE (Scallop) from Japan – Plenty good, but really nothing to write home about. 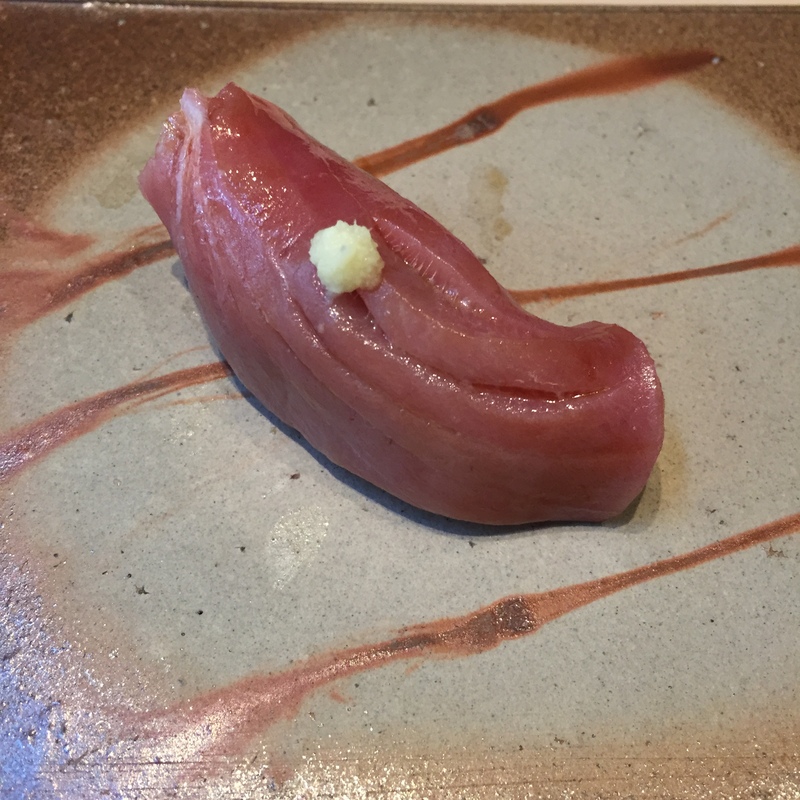 OTORO ABURIed (Super fatty tuna torched) – Topped with shaved, and mildly marinated radish. Another great cut of TORO. Same sentiment, Saito-san knows his Tunas. 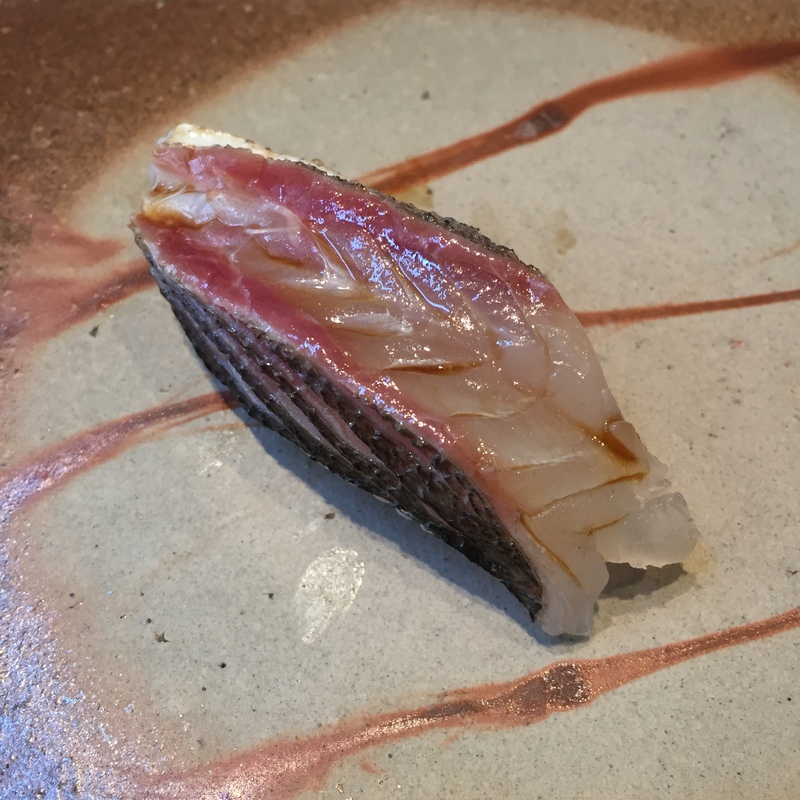 KOHADA (Gizzard shad) – We’ve been seeing a bit more of the egg-yolk dressing, bot atop, and between the fish and rice. I think I still prefer Saito-san’s version the best, with the KOHADA. 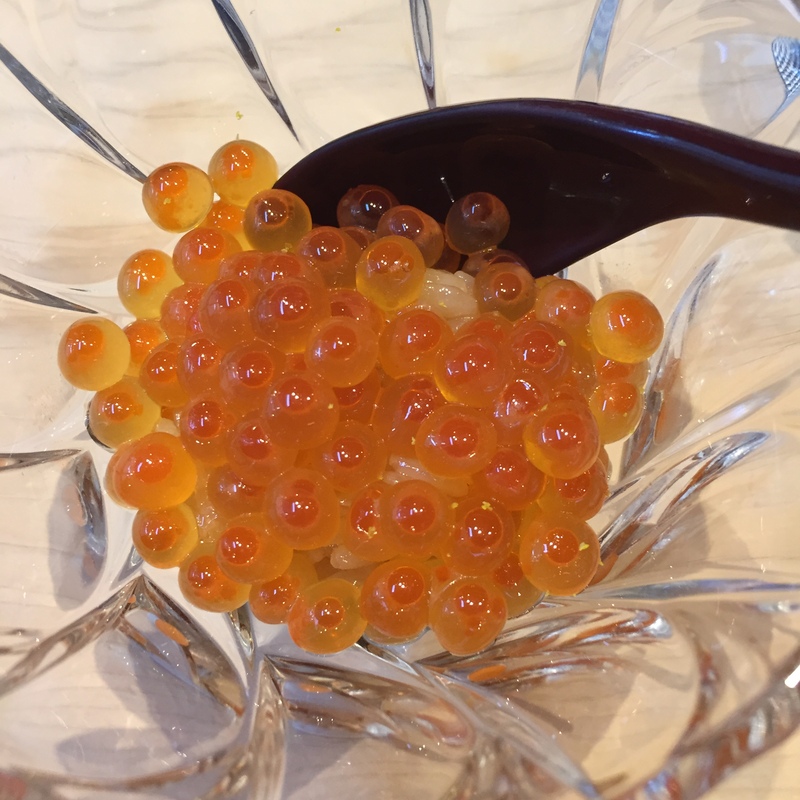 IKURA (Salmon Roe) – Look at those beautiful whole, non-crushed pearls! Delicious! 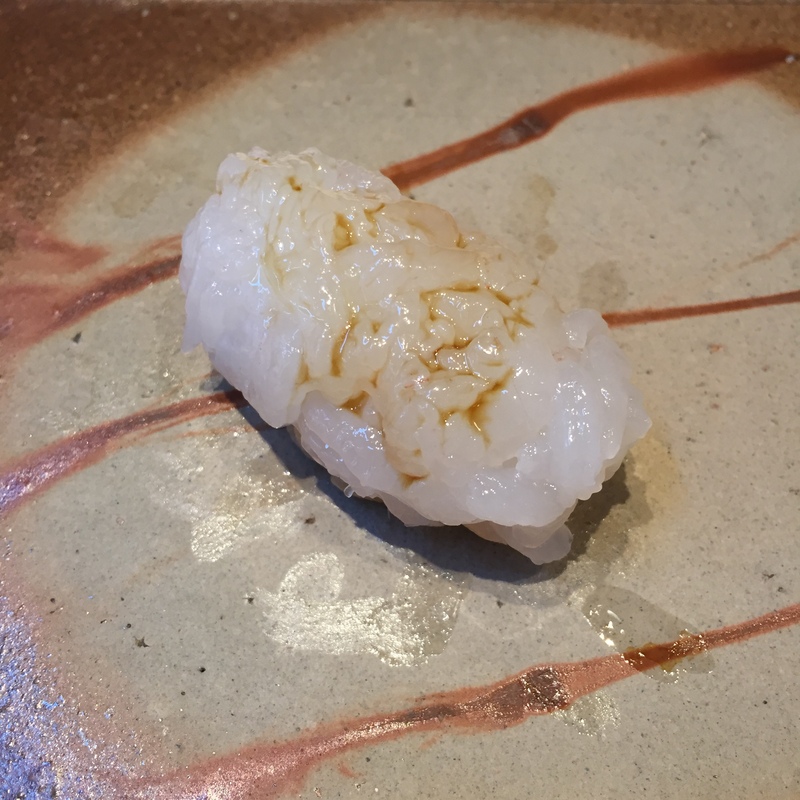 SHIROEBI (Sweet white shrimp) – In NYC, everyone loves the BOTAN EBI, it’s what is served in 99% of sushi-yas. 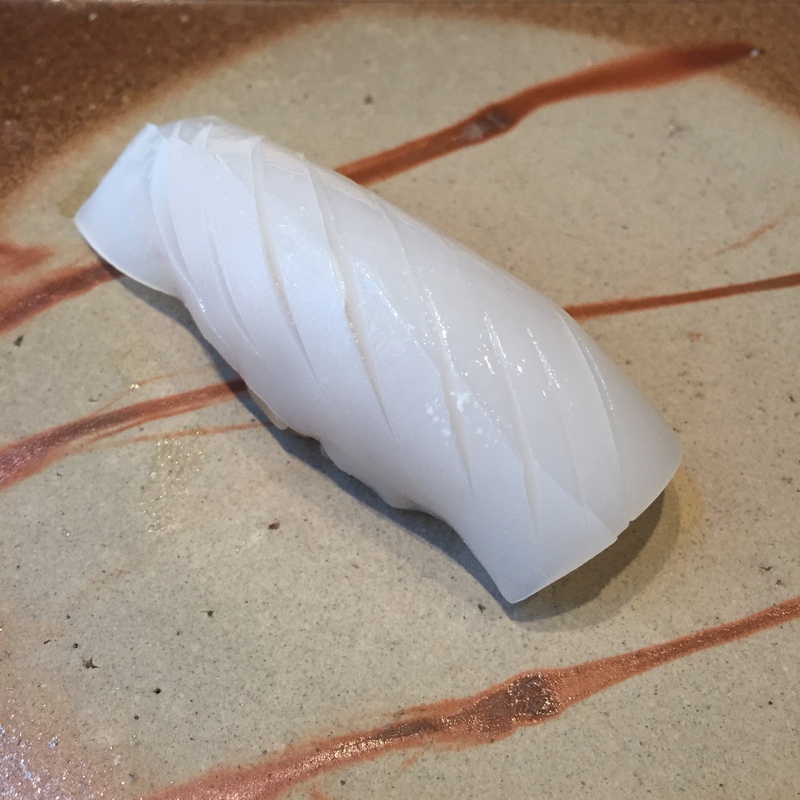 The SHIRO EBI has a completely different taste and texture. It has no crunch at all, but is incredibly sweet. 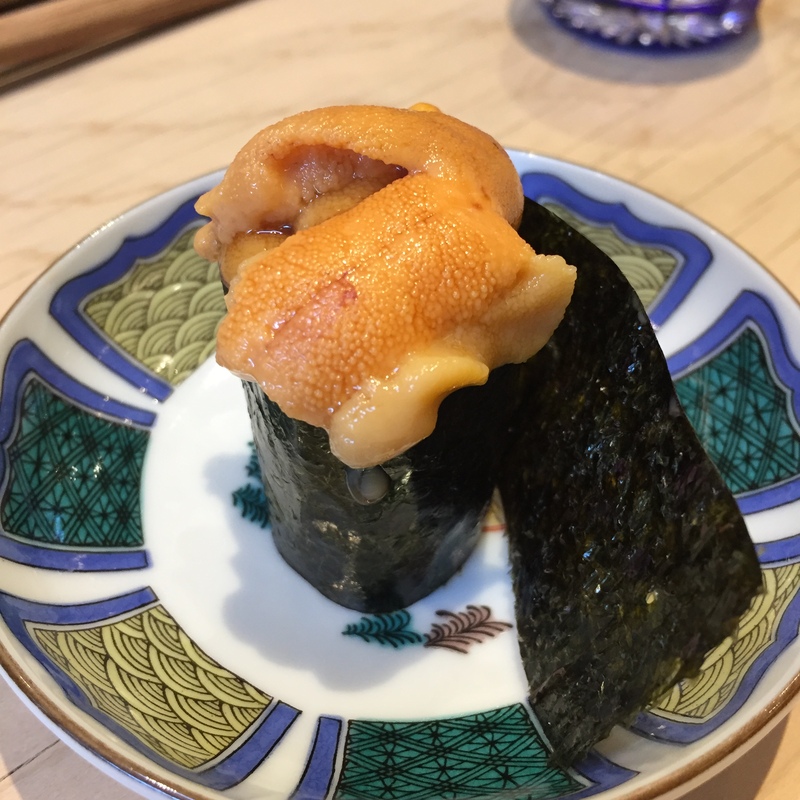 HOKKAIDO UNI with HOKKAIDO sea salt – Same as our last Saito-san Hokkaido UNI serving, this was just fantastic. So good. 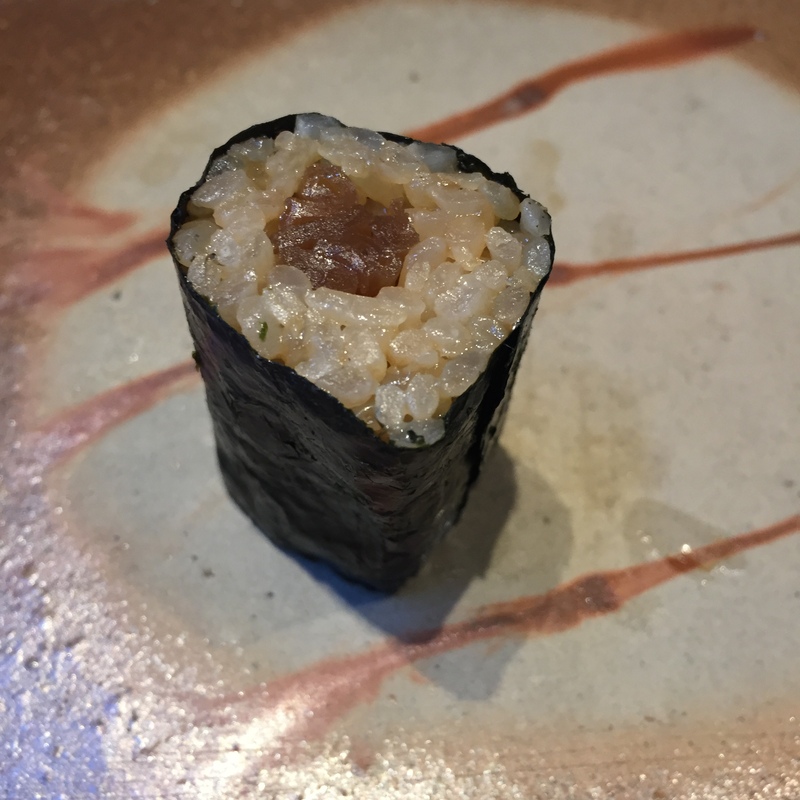 Vegetarian roll – EH… It’s fine, but really, I don’t want to waste my stomach space on anything other than raw fish. 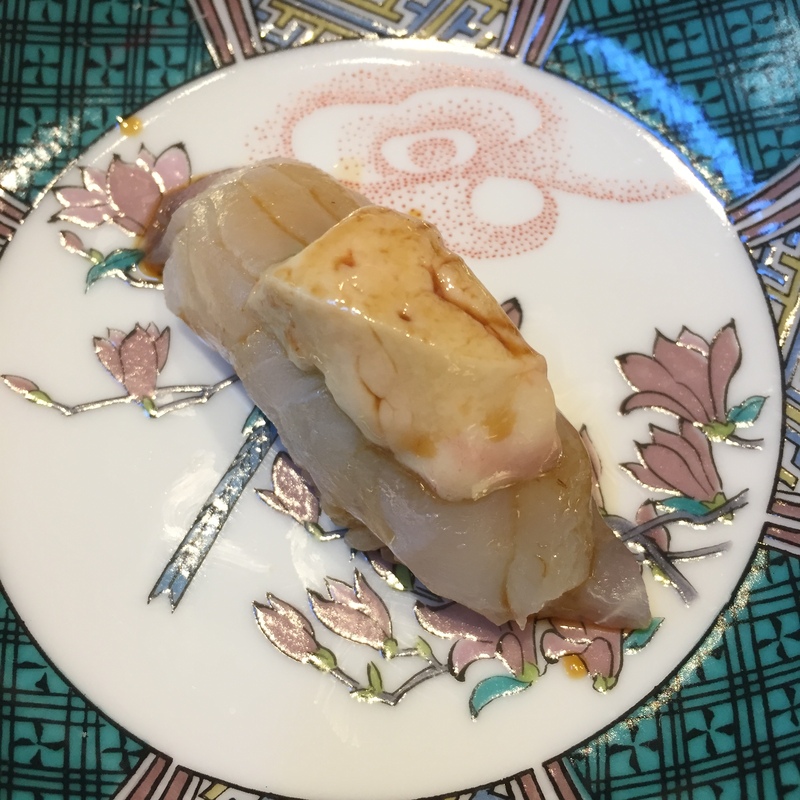 KAWAHAGI (Filefish) – I LOVE KAWAHAGI. It’s is so rarely stocked in NYC sushi-yas. I think I’ve only had it at a handful of sushi-yas. Off the top of my head, KURUMA ZUSHI, KANOYAMA, and JEWEL BAKO, and that’s is. What makes this fish so special, is that it is always served with a cut of its huge liver. This liver in so different from the ANKIMO. It’s milder, silkier, and never fishy. 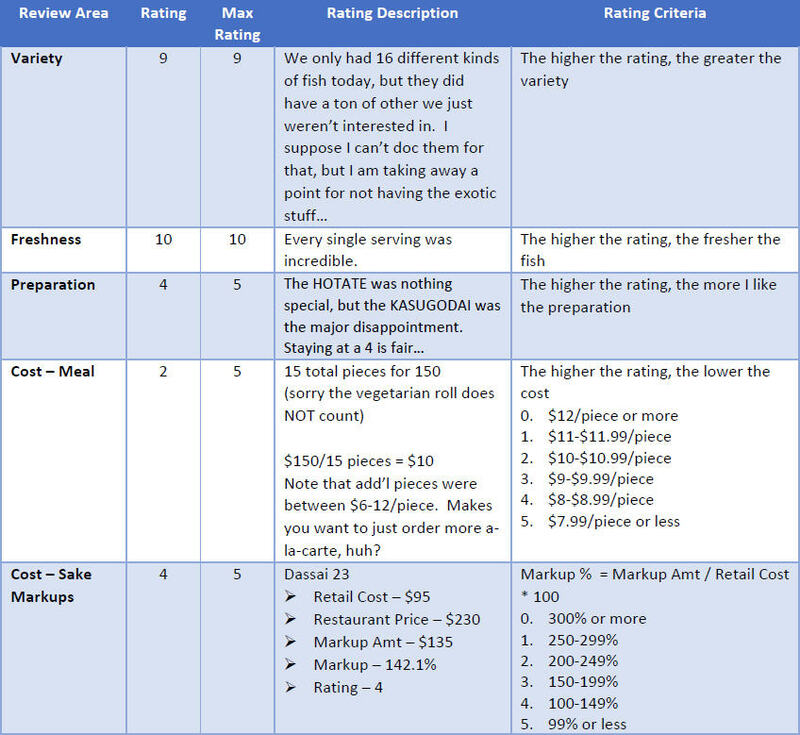 Another $650 lunch (for two), and worth every penny. Stock more exotic fish next time chef!